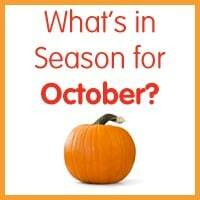 Eat seasonally. Take advantage of the many fruits and vegetables available during the summer and serve them as sides with any meal or for a snack. Cut up fruit, like melons, into bite size pieces and store in the refrigerator so they’re easier to take along to a picnic or pool, or eat anytime. You can enjoy lots of fruits in recipes like these Banana Crunch Popsicles or Green Smoothie Popsicles. Think ahead. By making extras of foods you’re already preparing, you’ll be one step ahead the next time you need a meal that is quick and easy. Grilled chicken, steak or fish are great additions to salads or burritos. Add some vegetables and beans and you’re good to go! Many salads, such as this Caesar Pasta Salad are also perfect make-ahead meals as they often need time for flavors to blend. Having several meals ready to go in the freezer are another big help. Marinated meats do great because you can just pull them out of the freezer to thaw in the refrigerator all day, then cook up in the evening after a busy, fun day. We keep lots of fresh, seasonal fruits and vegetables on hand too, so that they’re easy to add to just about any meal. Chill out. Invest in some good coolers and reusable cooler packs. When we find ourselves taking impromptu trips to the pool or going on a road trip, we like to bring fresh fruits and vegetables with us. I’ve invested in some small cooler bags and reusable ice packs to help keep our food fresh and cool the whole day. Keep the heat out of the kitchen. Take advantage of grilling out or using a slow cooker (Amazon link) to keep the heat out of the kitchen but help you serve up delicious meals. These Slow Cooker Steak Fajitas or Slow Cooker Ham & Pineapple are great recipes to start with! Remain flexible. Without the pressures to get homework done or go to after school activities, we like to keep our calendars open for meeting up with friends or going on a special outing when we can. For those days, having a rotation of about four or five meals ready to go at any time makes mealtime easier at the end of the day. Sandwiches, salads or tacos are favorites of ours because you can mix and match your ingredients with what you have on hand. Experiment with new dishes. For us, more relaxed schedules allow us to spend more time in the kitchen together trying out new recipes. Not only is it great quality time, but teaching kids important skills in the kitchen will serve them for a lifetime. 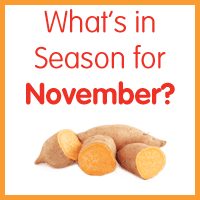 You might also some new favorites to add to your year-round meal rotation! 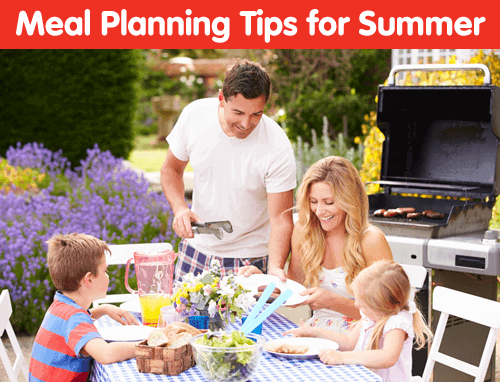 It’s easy to keep up with your meal planning during the summer if you keep these simple tips in mind. With just a little planning ahead you’ll be on your way to a delicious summer!